I arrived in Beijing three hours late due to the airport being closed because of a lack of visibility due to the thick smog that blanketed Beijing. 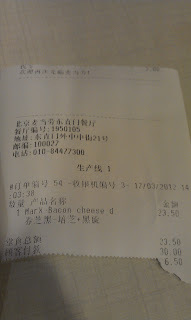 I knew exactly what I was going to try during my 12 hour stop in Beijing, and I had the coupon all prepared on my phone. One coupon was going to be able to order me both the promo item Bacon Cheese Double Beef Burger, and the new Blackcurrant McFlurry, or at least that was the plan. By the time I was able to get to the McDonald's just outside the airport express train, I was starving as I all I had to eat all day were snacks in the Asiana business class lounge at Gimpo Airport. I showed my coupon on my phone, and paid my money and about a minute later my burger was on the tray, but the McFlurry was no where to be found. 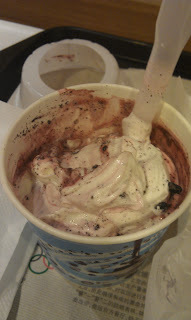 Another minute went by, and a red coloured McFlurry was put on my tray. 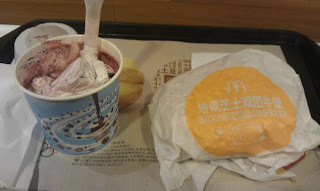 The Blackcurrant McFlurry shown on the coupon, and on the huge poster right beside me showed it to be a dark blue colour. It wasn't the Strawberry Oreo McFlurry they offer on the standard menu, as it didn't have any chocolate inside. The people who took my order didn't speak English and my receipt just had the coupon name, so I just thought I would be able to figure out what flavour it was when I ate it. The flavouring tasted very artificial, though there were small pieces of real fruit inside. I was certain not just strawberry, as it had a tangy flavour to it. It wasn't very good, but the more I ate, and the less flavouring that I was getting per scoop meant it tasted better the further down I got. 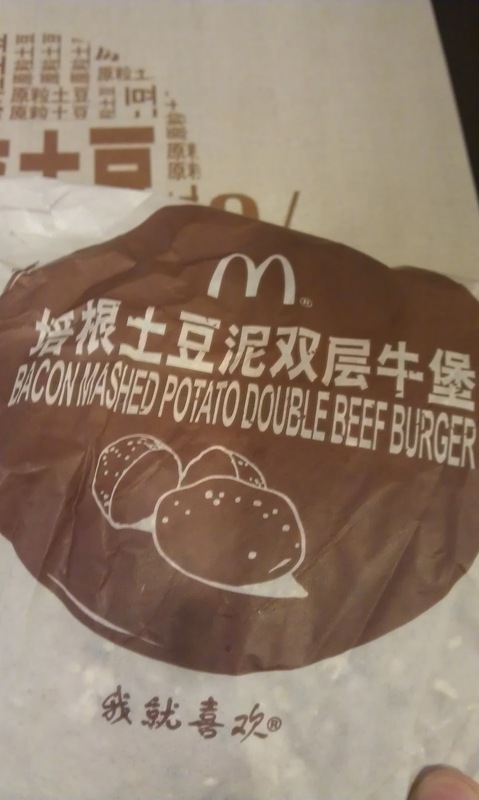 I only ate it all because I didn't get a combo, so I needed some thing to help wash down the burger. When I got back to Korea, my Chinese friend and I established it to be a Blackcurrant & Strawberry McFlurry, which wasn't on the promo poster, but available using a different coupon on their website...I don't know how I ended up with it, but oh well, at least it was a promo item. 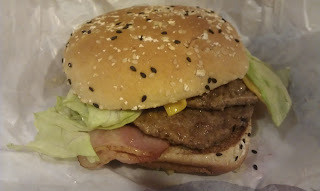 The burger was served hot an it actually had a surprising amount of flavour to it, I really enjoyed it. 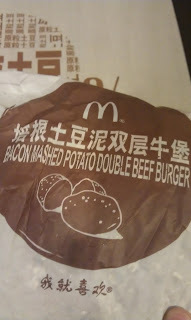 It had two standard beef patties separated by cheese, it had a big thick slice of decent tasting bacon as well. The bun, was not the standard sesame seed bun, but a nicer one, with herbs and black sesame on top. Not an overly unique item, but decent enough.